Check out more photos above for before, during, and after of this veterans home. See how we were able to make a positive impact in his life on a daily basis. Harvey reached out to the foundation for help by filling out an application on our website. He enlisted into the United States Navy in March of 1975. During his time in the military, he spent his time maintaining the radars on the USS Harry E Yarnell as an electronic technician. He was deployed on that same ship to the Indian, Mediterranean, and multiple times to the Caribbean oceans. During his service, he injured his foot. Unfortunately, his foot did not heal correctly. This caused an ongoing set of problems that he still deals with today. His foot issue has caused his ankles, knees, and hips to be out of alignment. This has also caused multiple back issues. Harvey was also exposed to chemicals in the service that have caused breathing, memory, and cognitive issues. He was planning to re-enlist, but the health issues prevented him from doing so. He received four good conduct medals, the sea service ribbon, and the national defense service medal. Ken, from Dogwood Construction, replaced bad siding on the front of the home, replaced the front door, remodelled the entire bathroom, and repaired miscellaneous flaws on the home. The bathroom remodel included new flooring with a new subfloor, new drywall, removing and replacing the shower with a handicap accessible one, adding a moveable shower head, removing the small low toilet and replacing it with a large taller toilet for easier mobility, removing the sink and replacing it with a pedestal sink, new paint, installing new lighting above the sink, and added a ceiling vent for better circulation. On the front of the house Ken removed about 1 ton of limestone and replaced it with long lasting vinyl siding. Castle Windows in Ft. Wayne Indiana is also donating a brand new front window because Harvey's was in such bad shape. Before the remodel, it was very difficult for Harvey step and get into the old dye-cast metal tub. Not only was the tub not wide enough but it did not have handles for him to hold onto. Elaine, his wife, stated that it was an accident waiting to happen. After all of the renovations, Harvey is now able to be in the bathroom without having to worry about falling or getting injured (again). His hobbies include building tabletop computers and even does landscaping in his wheelchair! He takes pride in having a nice yard. ​Yet again, the Wounded Veterans Foundation was blessed to spend time with Harvey and his family and to make sure that Harvey can get around his home without having to worry about injury. We came across Steve’s need for a home modification when we were searching for a veteran in Ft. Wayne to assist in early 2017. Steve enlisted into the United States Army on April 26, 2010. His MOS was Airborne Infantry in the 82nd Airborne Division. He was deployed to Afghanistan in 2012 and was conducting operations for 7 months. Upon returning to the States, during a practice jump, Steve was severely injured, and little did he know how much the rest of his life would be impacted by this jump. He was honorably discharged from the Army on September 26, 2014 and got out as an E4, Specialist. He received various medals, two of which include the CIB (Combat Infantry Badge) and the ArCom (Army Commendation Medal). Steve suffers from injuries that are in his legs all the way up to his neck that make it difficult to stand for just a few minutes. This has caused Steve to be in a wheelchair. Before renovations, Steve’s mobility was limited by the size of the doors. He was limited to only being able to enter through two doorways in his entire home. He was weary to get in the shower, just because it was difficult and painful for him. The ability to move freely in his home was nonexistent. 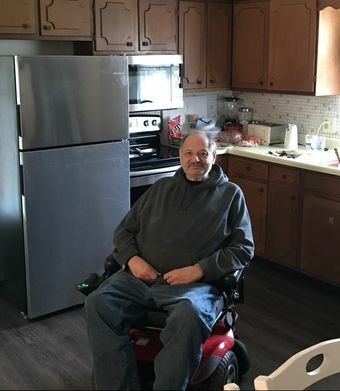 After renovations were completed Steve could get in and out of ALL rooms on the main floor in his home and he could “roll in” his handicap accessible shower and sit down. A ramp was also built on the back of his home from the back porch to the driveway so that he could get to his vehicles without any trouble. He has complete freedom to roam about his house in the wheelchair without limitations. His hobbies include woodworking, playing with his kids, video games, and doing anything outdoors with his family. ​Steve and his family were such a joy to work with during this process and board members of the Wounded Veterans Foundation are truly grateful for the friendships we created. The Wounded Veterans Foundation searched for a veteran in need for a special project opportunity that was presented by the owner of a construction business located in Indiana. This opportunity lead us to Pete. With the help and donations of many generous businesses and supporters, he received assistance through our housing department. Pete enlisted in the United States Army on June 21, 1973 and served until May 31, 1996. His various jobs in the Army included Telecommunications Specialist, Recruiting and Retention, Engineering, Chaplains Corps, Battalion Personnel NCO, and then finally retiring in May of 1996. He served during Vietnam, Invasion of Grenada, Desert Storm, and Desert Shield. His duty stations included Fort Gordon, Germany with the 69 ADA communications specialist group, Stanton, California, Fort Monmouth in New Jersey, Fort Benning, Fort McCoy, Panama, and Ft. Wayne, IN 1st Battalion 293rd infantry. His hobbies and interests include collecting stamps, classical records and ceramic dogs. As well as restoring his grandfather’s guitar, sewing molas, reading, singing and composing music, and is a member of the Senior Saints, which is a traveling singing group. ​He currently resides in Indiana with his wife, two boys, and family dog Buddy.